Have you ever dreamed of being a superhero? I sure have! 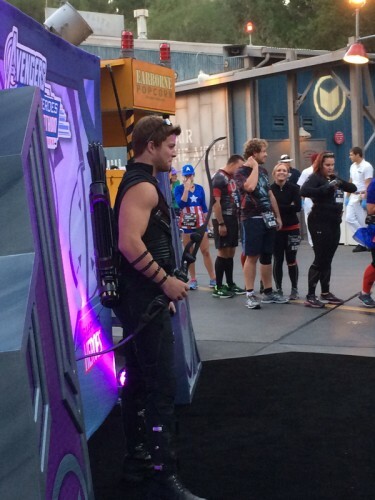 That’s just one of the reasons I signed up to run the Inaugural Avengers Half Marathon. Being a cast member, my journey into the running world started a long time before I laced up my first pair of running shoes. 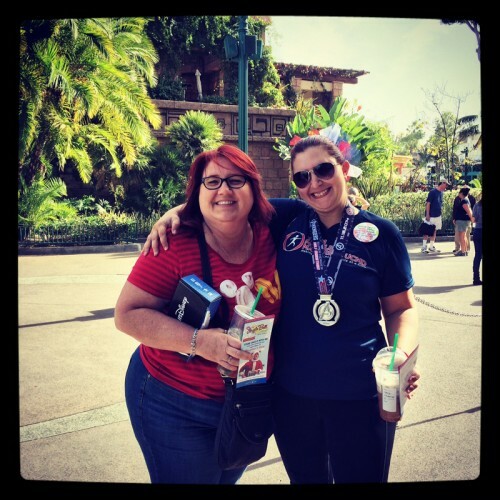 I worked every runDisney event in some capacity and when 2014 started, I added running a half marathon to my list of resolutions. 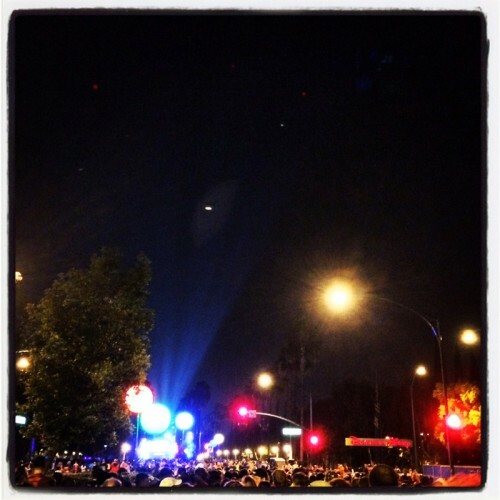 By the time I finally got over the butterflies about taking on such a big race though, I had missed the deadline for the Disneyland Half Marathon. 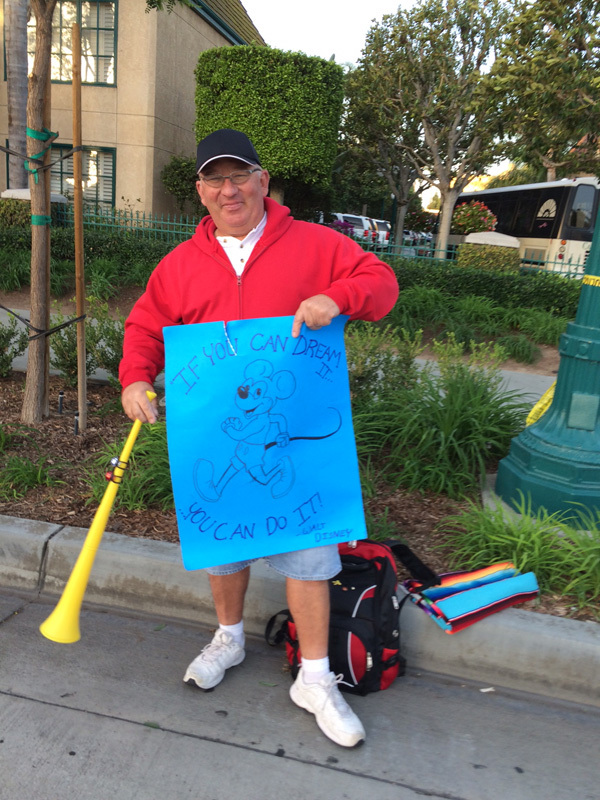 Through the runDisney website I found Team Muscle Makers for UCMD and started my fundraising campaign. Not even two months later, runDisney announced the Avengers Half and I signed up with Team Muscle Makers for that race as well. 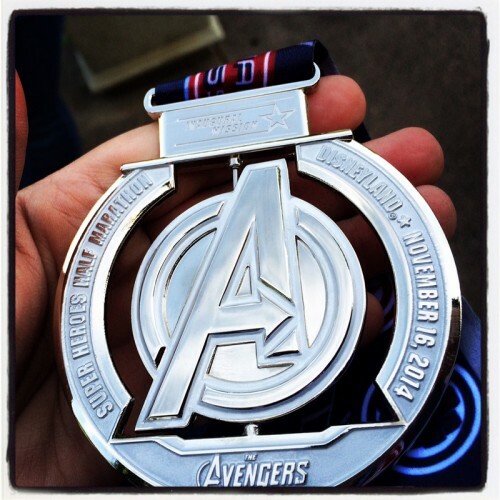 Fast forward 6 months, probably the fastest 6 months of my life, and it was Avengers Half Marathon Weekend!! I spent both Friday and Saturday attending the expo, hanging out with my teammates, and visiting with my fellow cast members who were working the event. I have to say one of the best parts about running as a cast member is the encouragement from my cast before, during, and after the race. It was like I had my own personal cheering squad! Race day started bright and early (ok maybe not bright! 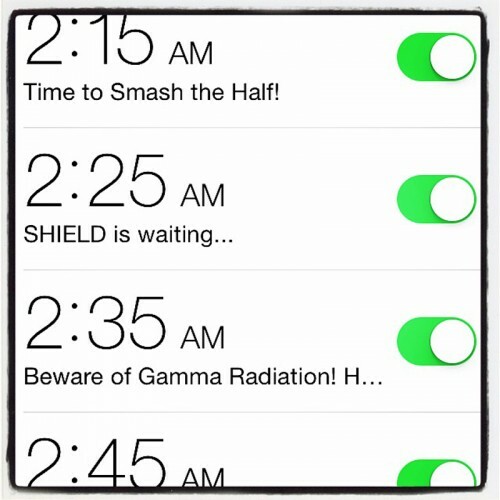 Lol) and I set my alarms probably far earlier than I needed to. During the Disneyland Half I had stayed at a Good Neighbor hotel but this time I was coming from my house and I had no idea what kind of time I would need to park and walk to the gear check. 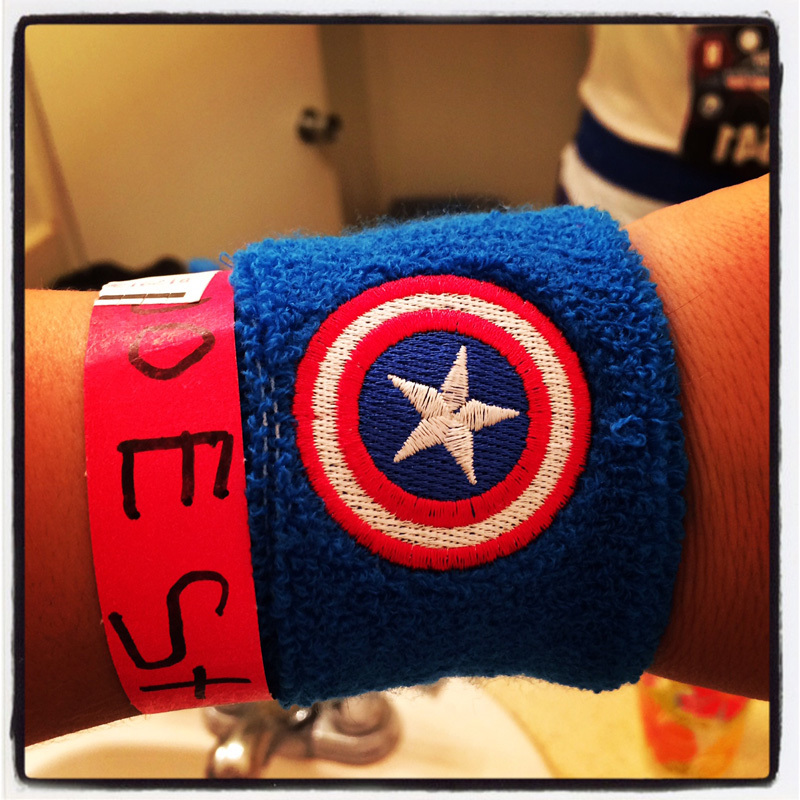 After double checking my gear multiple times and putting on my Captain America costume, I added the final touch which was my Team Muscle Makers wristband. The kids we were running in honor of made us all wristbands to wear during the race. I ran for Joe. The drive and parking went quickly and left me with plenty of time to check out the stage by the family reunion area. I snapped some pictures with the Agents of SHIELD, who decided I am Hydra because I can’t Macerena. I also saw more friends from my work locations who despite my nervousness were quick to tell me how awesome they knew I would be and wish me luck! 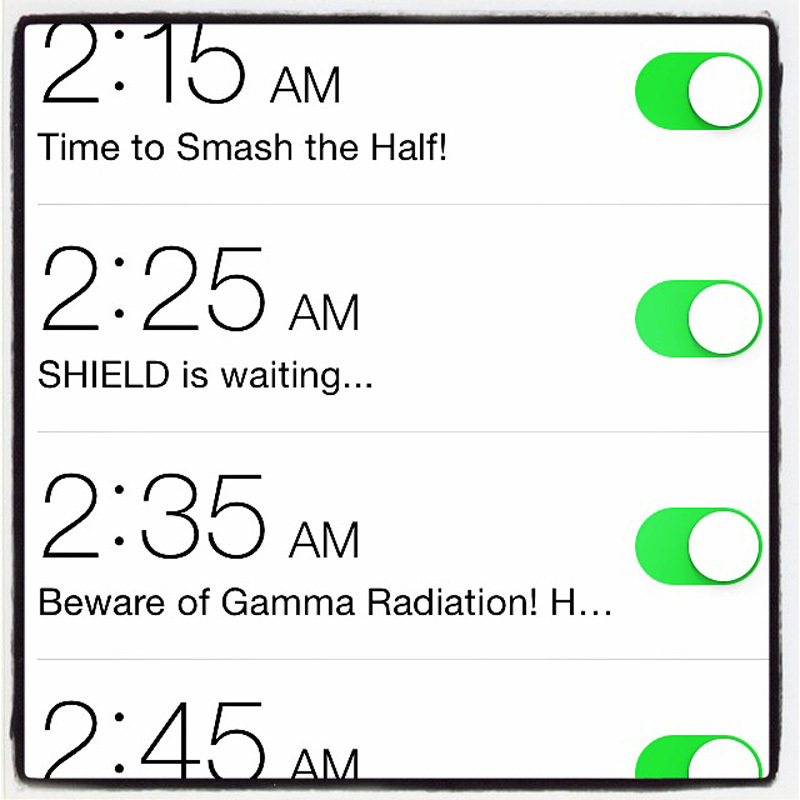 The cast photo was scheduled for 4:15 am and we quickly assembled in front of the stage. 80 cast members ran in the first ver Avengers Half Marathon. As we were lining up, the announcer said something about missing a few people and naturally we all started looking around for the missing people. Right then out came the Avengers!! 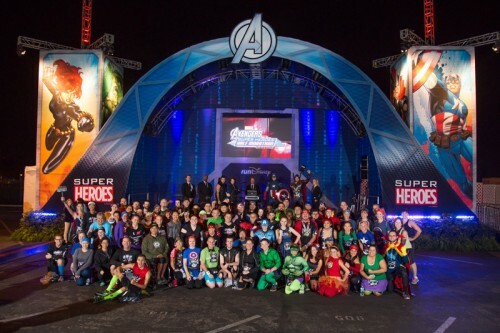 The cast members were as excited as the kids we make the magic for as Hawkeyes, Black Widow, Thor, and Captain America took the stage. Once the photo was finished, it was time to head to the corrals! 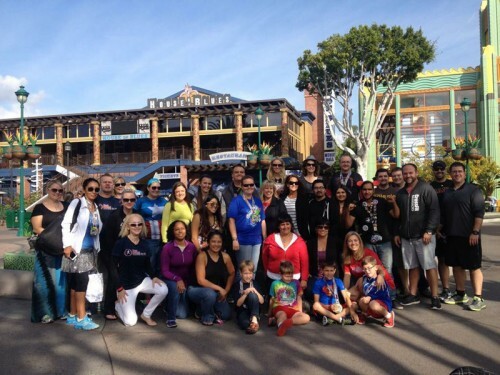 I met back up with Team Muscle Makers for a quick team photo and off to the corrals we went. I was the only one in Corral H from the team and so I had to quickly split off from the group. At this point, the nerves were starting to kick in and I decided to people watch. 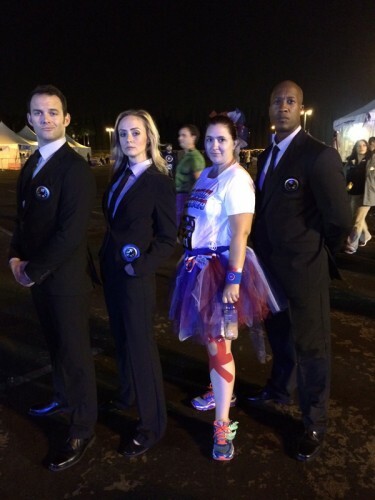 There are no shortage of things to see in a runDisney race and there are truly no limits to the costumes. 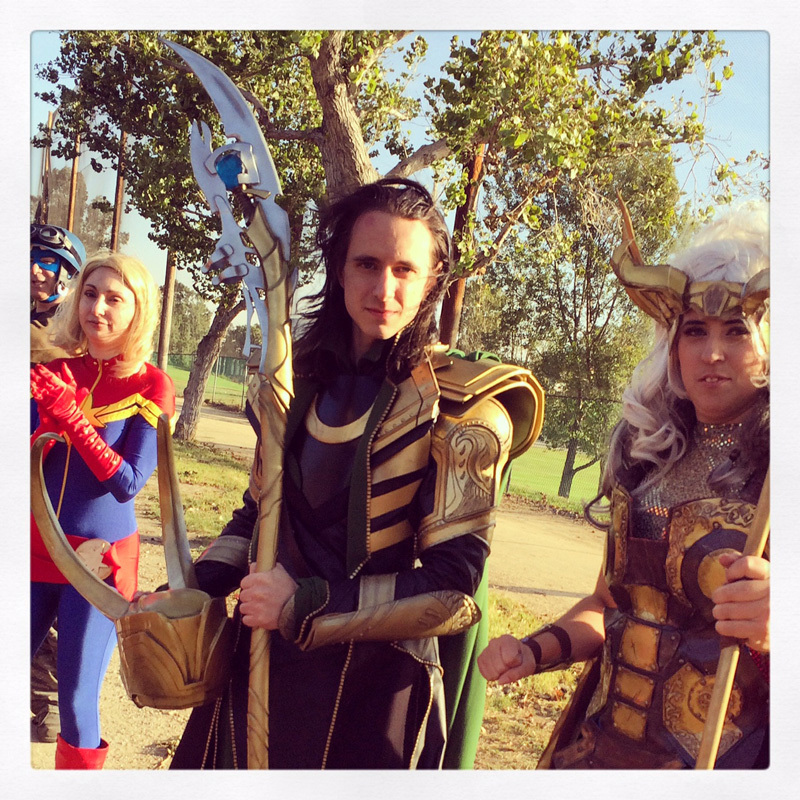 I saw all the Avengers, some lesser known Marvel characters, and even one guy dressed as an LA King in full hockey gear! Just as I settled into the corrals, I realized I never checked my sunglasses with my gear but was far enough in I decided to run with them since I didn’t want to give up my spot. With more than an hour ahead of me in the corrals, I made small talk with other runners until race time.. One couple was running their first west coast race going for their Coast to Coast medal and another woman was running her first half. Time flies when you are having fun and race time was quickly upon us. Corral H was a very large corral and race start was crowded with lots of people straying on to the sidewalks to go around the packs of walkers. The course was quite different than my last race and we headed into California Adventure right away via backstage and into CarsLand. 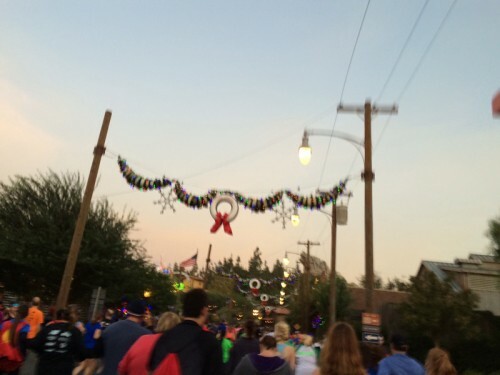 CarsLand was beautiful all decorated for the holidays and Mile 1 was there before I knew it. We headed towards Condor Flats, passing Grizzly River Run and I spotted my first character. Hawkeye was standing by Soarin’ Over California but had a huge line. I waited just a second until someone stepped away and took a quick picture of him. I’m a slower runner and I wanted every last second to make sure I didn’t get swept. 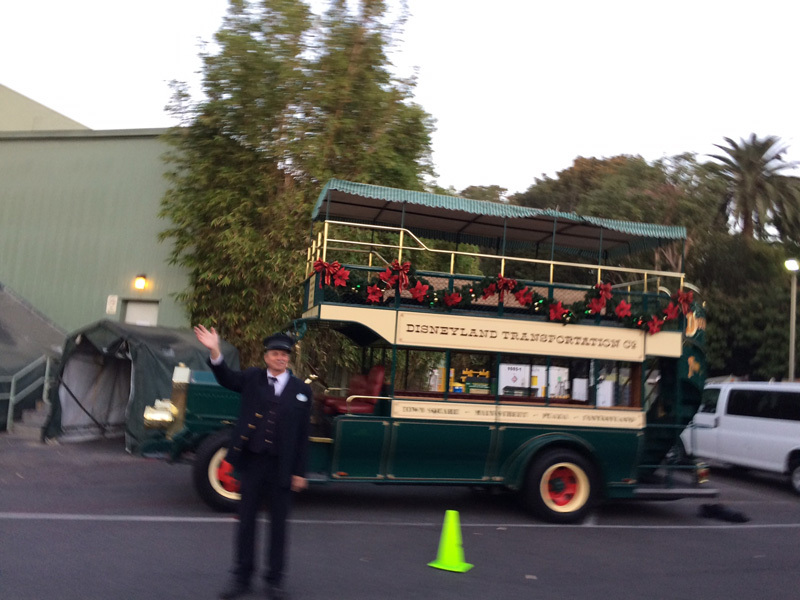 Exiting Disney’s California Adventure and entering Disneyland via backstage, I spotted our Main Street Vehicles cast members waving and encouraging the runners along. Continuing backstage, we entered the park through Splash Gate and into Critter Country. 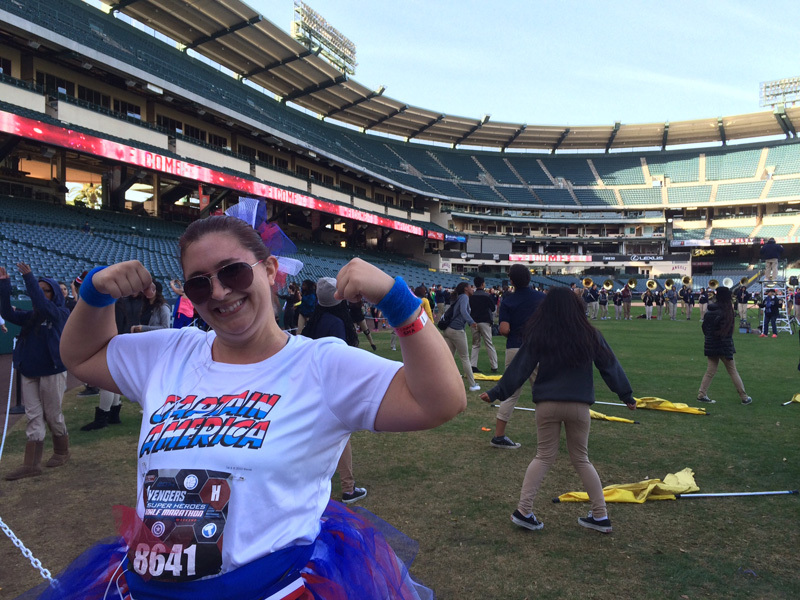 This is the part of the course I was most excited about (second being Angel Stadium) because it’s my second home. I’ve been a cast member for a long time and I’ve been part of New Orleans Critter Country (NOCC) Attractions since 2008. We passed Splash and Pooh quickly and came upon a SHIELD agent warning us of the hill leading up towards the Haunted Mansion. 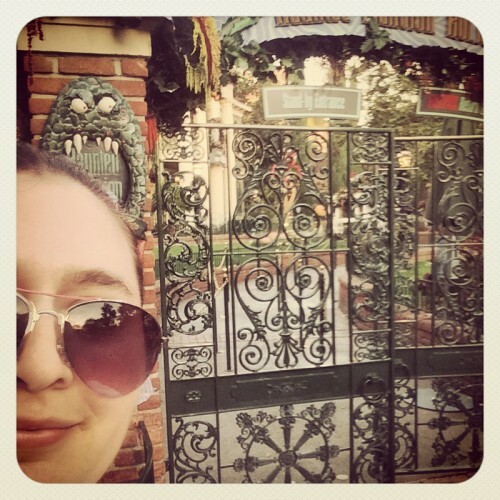 I snapped a quick selfie with the gate of my house.. Yes, my house lol. I think I spend more time there than I do at home and once again debunked the rumor of death certificates as I ran by. Mile 2 and Black Widow was in front of the Golden Horseshoe but her line had already been cut off due to how long it was. Through Fantasyland and out through the castle was next, and I saw a big group of our third shift Custodial with a big sign that read “Third Shift Custodial Welcomes You” as well the the beginning of the chEAR squads. My favorite sign read “You look MARVELous!” I noticed there weren’t very many signs compared to last time but continued running down Main Street and out of Disneyland. 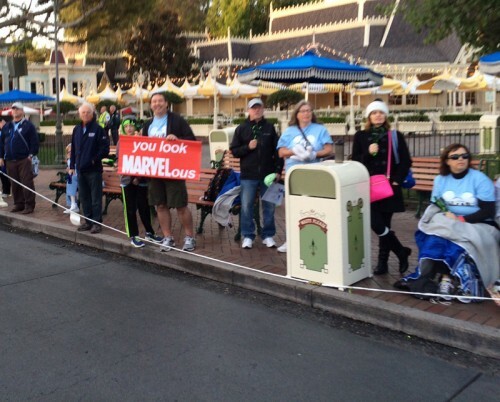 The cast members pointing the way to Harbor Blvd had a ton of energy and were cheering us on all the way. As I moved down Harbor I saw mile maker #3 and that was the last one I saw for awhile. Right after I passed #3, I saw some of my Team Muscle Maker teammates with some signs and I stopped for a quick picture. Crossing Katella, I quickly noticed one big change. The WIND. It was blowing so strong that cones, markers, fencing and signs were blowing around the course! Dirt off the nearby construction zone had runners stopping in their tracks. Remember those sunglasses I forget to check? Boy was I grateful I had them!!! Turning down Chapman made the wind seem worse bc now you were running straight into the wind. Runners were losing costume pieces, hats, and debris was flying at us. I made the comment (not knowing how loud I was – thanks headphones!) 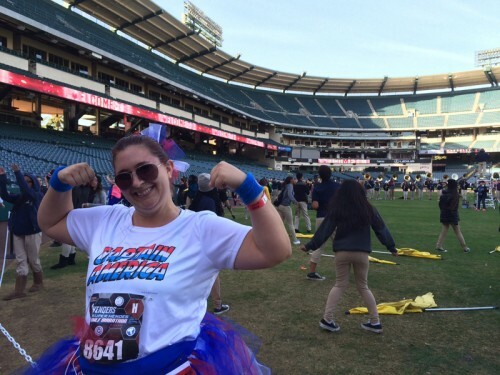 about “not realizing this was an obstacle course” which was met with cheers from the runners around me. 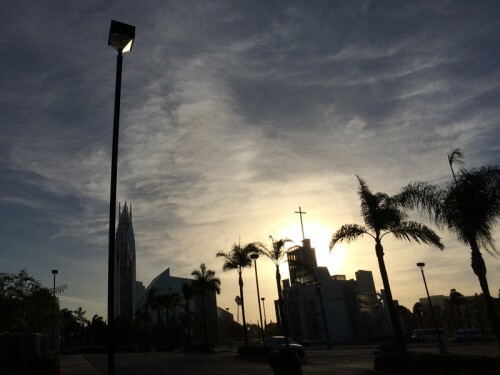 We headed into The parking lot of the church (formerly Crystal Cathedral) and the volunteers were soaking wet from the water flying everywhere. Huge shoutout to them for sticking with us despite the crazy weather. I never saw the next couple mile markers because they had been destroyed or blown over by the wind. 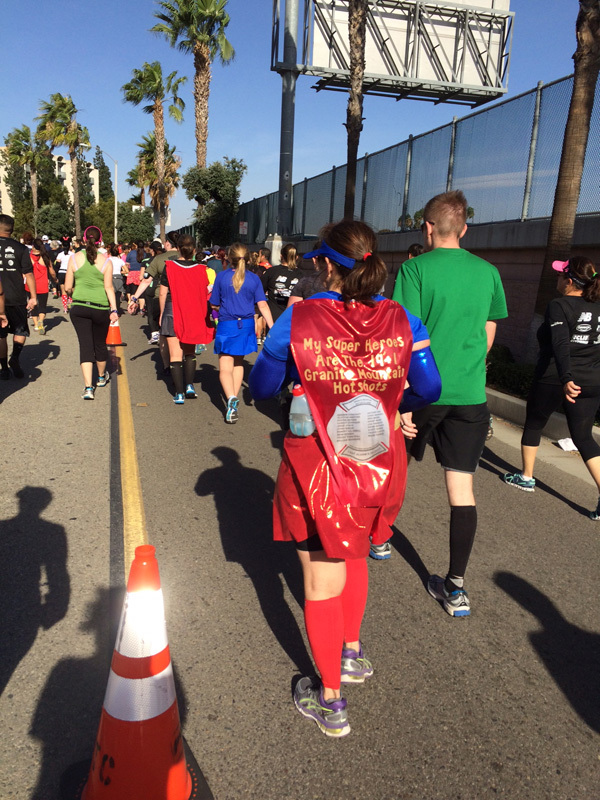 There was a huge hill just before the Santa Ana River Trail and I quickly snapped a view of the runners behind me. 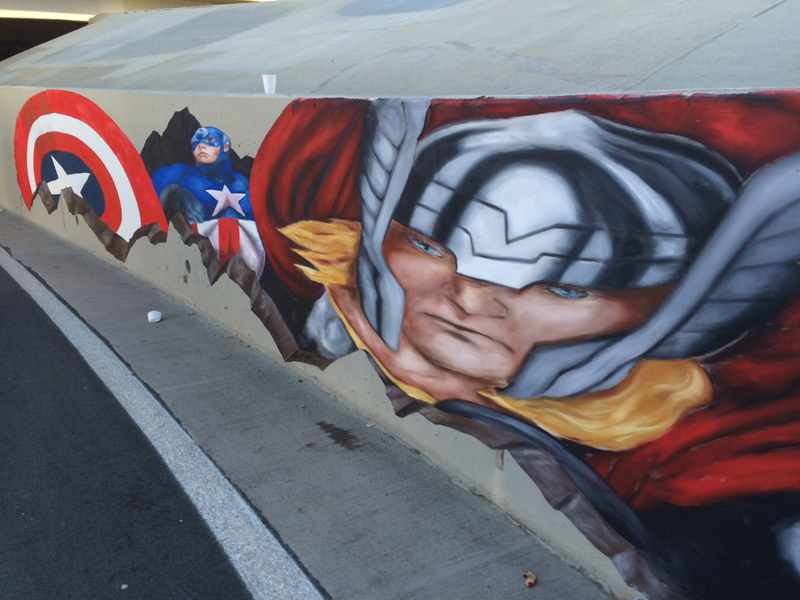 The river trail was a nice long straightaway that started with some gorgeous Avengers art on the wall. Along that stretch I met a runner who had done all the runDisney races this year and saw Ramiro (who was the inspiration behind my running shirt for this race). Also along this stretch was some of the best cosplay I have ever seen. My favorite was Loki! Leaving the river trail, we headed into Angel Stadium with a huge tailwind. I probably wasn’t but there were a few times I thought I was airborne! With the help of another runner I got a few pictures of myself on the field (including the photobomb I didn’t notice until after the race!). If I wasn’t being timed, I would have hung around the stadium all day. 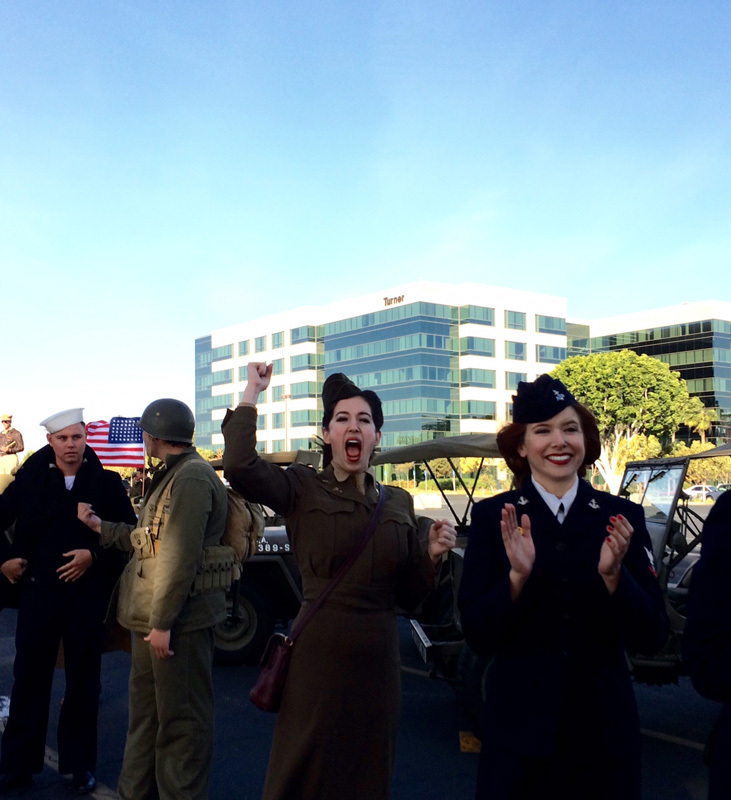 Leaving the stadium, I came across the WWII military set up. They represented very branch of the military and I was told that some of them were veterans! 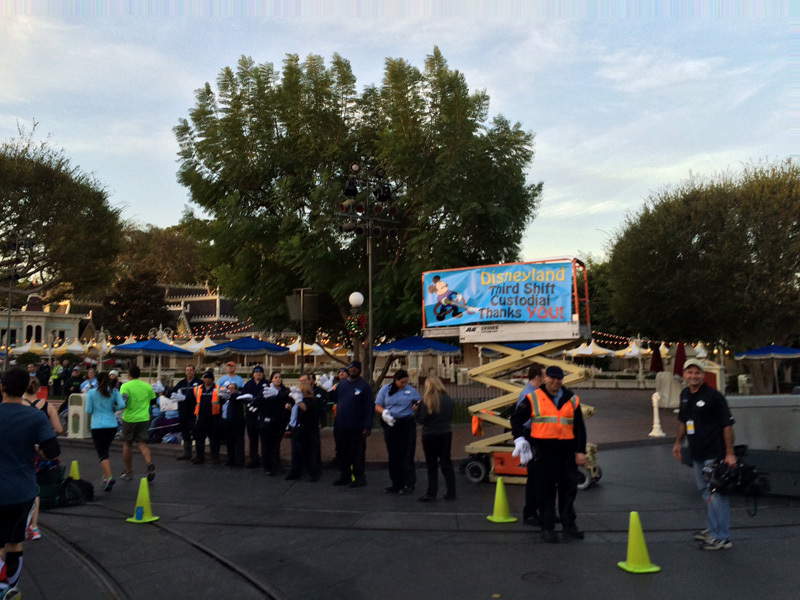 Disney Way, someone came running through yelling about the people sweeping. Everyone took off and seemed a lot like the stampede in the Lion King! 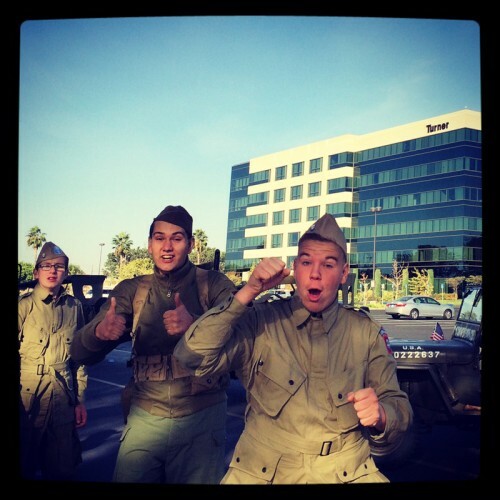 I did see the bike guys as I crossed Anaheim Blvd but checking my watch I knew I was well above the pace. Double checking, they told me I was fine. From that point until we hit Harbor Blvd again was probably my least favorite part of the course. It was tight with lots of people and the cars were still traveling next to us and seemed to pay more attention to the runners than the road. 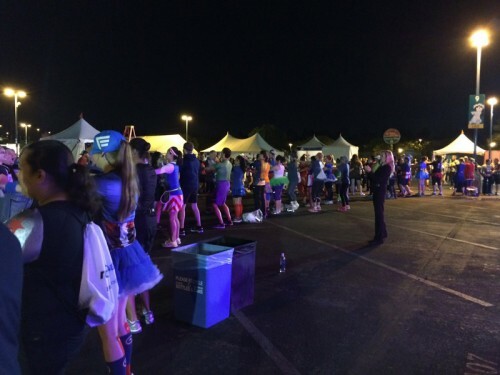 I saw the official runDisney 16min/mile walkers (aka the ballon ladies) and I realized how much time that tight stretch on Clementine had cost me. I picked it up all the way to Disneyland Drive when all out fatigue and hip pain hit me. I was so close!! As I came into the Simba parking lot, there was a local high school chanting “Hail Hydra!” I laughed so hard, it shook me out of my momentary funk and pushed me forward. 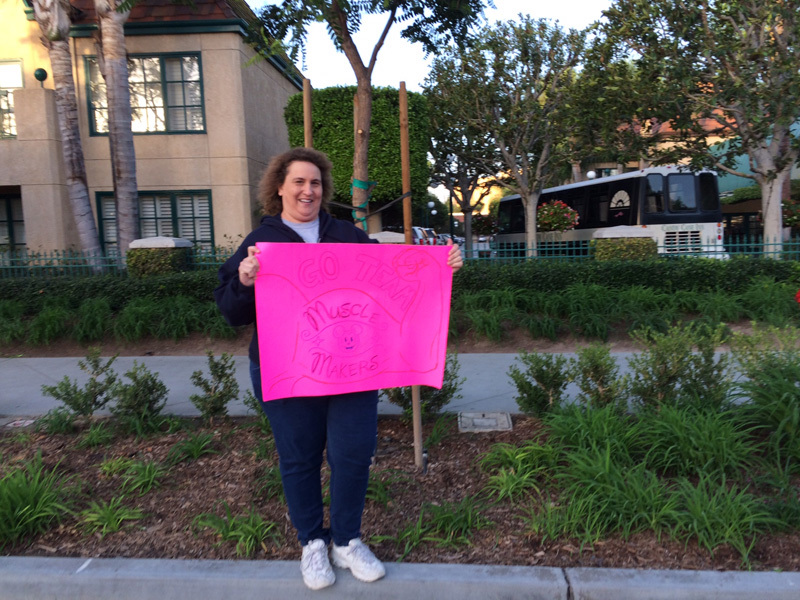 Just past the Paradise Pier, I saw Rhoda (another NOCC cast member) and I ran over for hug. Everything hurt and she just looked at me and said “You are at 12.9! Keep going! You got this! 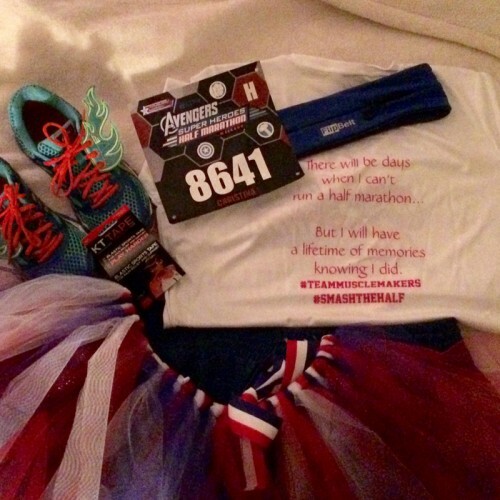 !” It was seriously just the thing and I pushed forward through to the finish line! Waiting there was one of my closest friends, Laura, who greeted me with a huge hug and walked with me to get my medal. 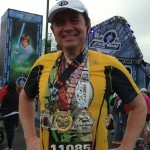 There is no doubt that “runner’s high” is a real thing because there is nothing like having that medal around your neck! I quickly grabbed my gear and headed towards Downtown Disney because the Fmaily Reunion Area had been closed due to the extremely high winds. There I met up with MaryJane (one of my moms closest friends since high school) who came out to see me finish the race. Despite the crazy wind, the Avengers Half Marthon was one of the most fun races I’ve been a part of. And the best part? I set a personal record!! I finished in 3:39 almost 7 minutes faster than my DL Half time! 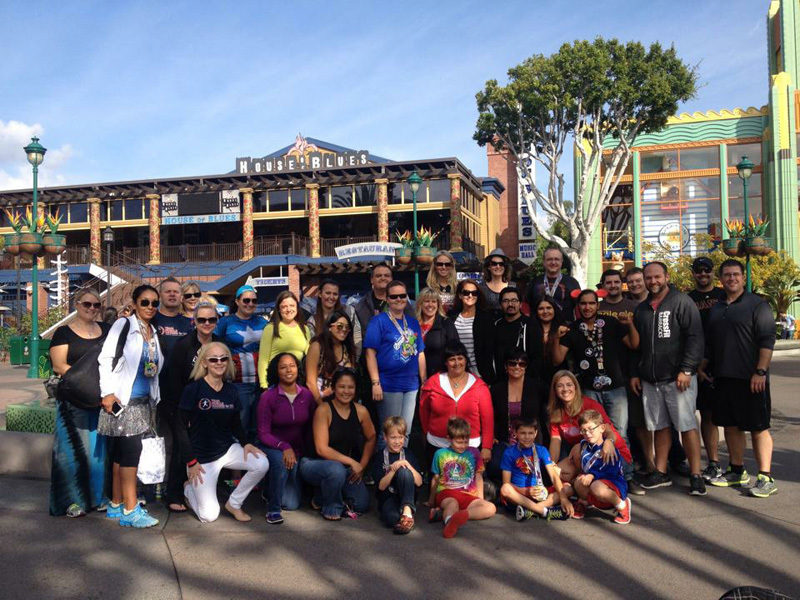 I want to say a huge thank you to all the cast members and volunteers who came out to the race to make it a reality! Laura, Rhoda, Jessica, Michael and all the cast members who cheering me on before, during, and after the race – thank you! Thank you to my husband and boys who were waiting at home with huge hugs – thank you! And Team Muscle Makers for UCMD thank you for letting me be a part of your amazing team. Great report, Christina! 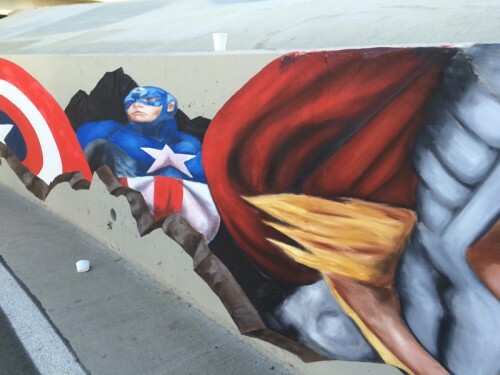 That wind sounds fierce- but you were fiercer! Congrats Christina on finishing with a personal best! Love when Cast Members have fun with the rest of us Disney fans since they are the ones who make park visits truly magical. Thanks!! I had a blast! 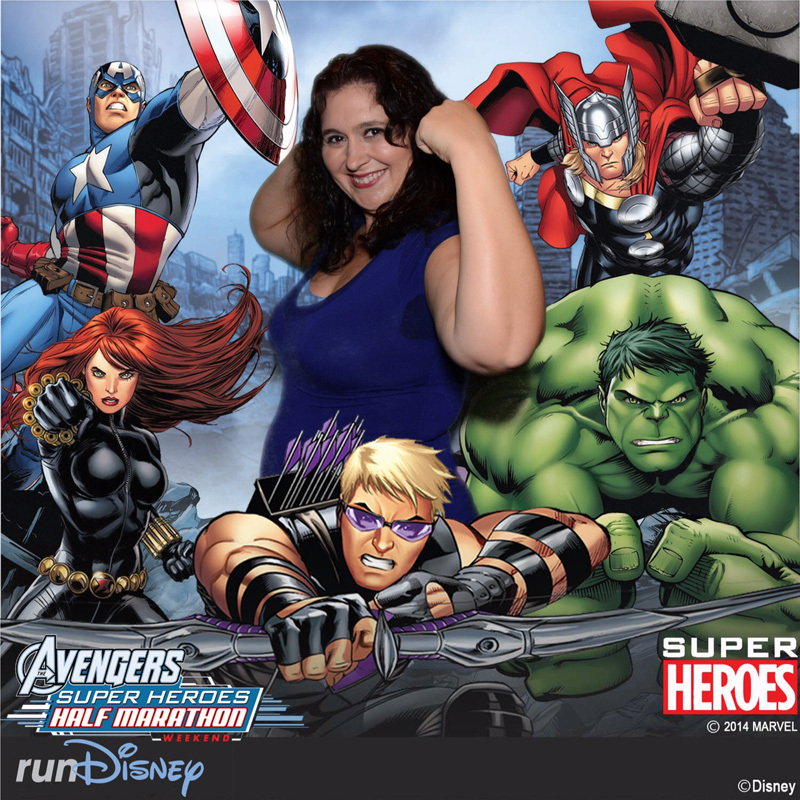 Can’t wait for my next runDisney race!